An amazing new image of the Crab Nebula, which is made up of the remnants of a bright supernova explosion that Chinese and other astronomers originally observed as a star in 1054, has been created by combining data from telescopes around the world. 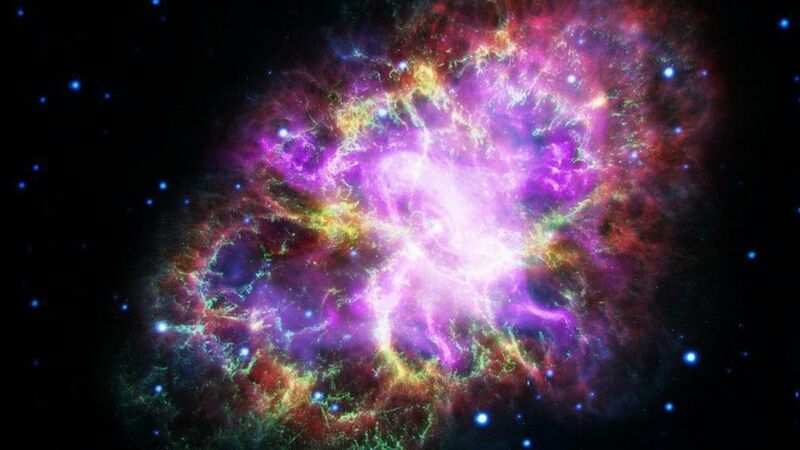 Distance matters: The Crab Nebula is 6,500 light-years away from Earth — but NASA reports if it were 50 light-years away it would have irradiated Earth and killed off life at the time. Why it looks the way it does: Neutrons at the center of the mass (called a pulsar), fast-moving particles coming from the pulsar, and the surrounding material that came from the original supernova explosion itself give the nebula it's unique shape. Data from five telescopes were combined to create a new image of the nebula: The VLA (radio) in red, Spitzer Space Telescope (infrared) in yellow, Hubble Space Telescope (visible) in green, XMM-Newton (ultraviolet) in blue, and Chandra X-ray Observatory (X-ray) in purple. Why it exploded in the first place: Stars explode when they acquire too much mass, which either happens when it's too old or when it consumes another star.